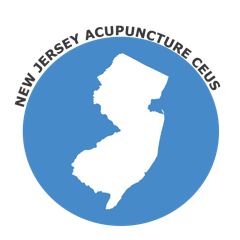 The New Jersey Acupuncture Board accepts NCCAOM PDA or CEU courses to fulfill licensing requirements. Please visit the NCCAOM PDA or CEU page for course listings. Chinese Herbology or Oriental Medicine certification is required to practice herbs. 30 Hours/PDAs/CEUs every 2 years, currently ending on June 30, 2019. Each applicant every 2 years must renew his or her acupuncture license and complete during the preceding biennial period a minimum of 30 credits of continuing education. Up to 15 hours/PDAs/CEUs may be completed in Distance Learning Courses approved by the NCCAOM. Herbology Requirement: Acupuncturists who are permitted to practice herbology shall complete at least 10 hours of continuing education related to herbology as part of the 30 hours of CE he/she is required to complete. The process of getting New Jersey continuing education credits is simple, convenient, and easy: Download the course, finish the online quiz, and receive your certificate of completion immediately. You can finish all your continuing education requirements on you desktop, mobile phone, or I-Pad. Course reading material is printable. Courses are either in a written or a live webinar. Visit our Acupuncture CEUs page to find out about any other state requirements. Your license number, name, and date will all appear on the CEU Certificates automatically.